MR vaccination Awareness drive from August/ Measles and Rubella vaccination Drive/ Mega MR vaccination programme/MR vaccination campaign 2017: Measles and Rubella vaccine will be given to children from 9 months to 15 years of age. For the first time in the State, the health authorities will launch a massive Measles and Rubella (MR) vaccine drive aimed at covering close to 90 lakh children between August and September. 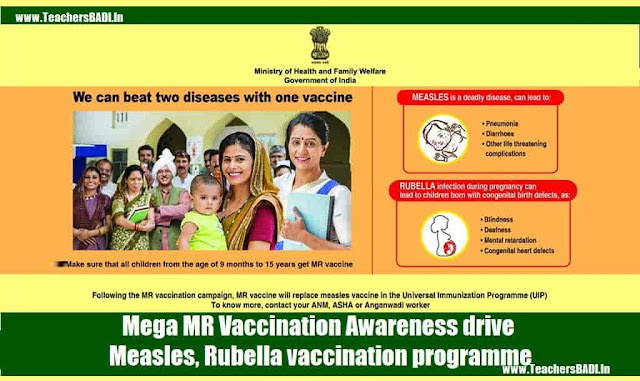 The MR vaccine administration and awareness drive, which is a part of the National Measles Elimination and Rubella Control Programme of the Centre, will be taken up between August 17 and September 25 and will cover children from 9 months to 15 years of age. Irrespective of whether children and adolescents between the age group of 9 months and 15 years were given MMR vaccine earlier, all children would be covered during the month-long drive. Health Minister, Dr. C. Laxma Reddy launched on August 8 the massive Measles and Rubella (MR) vaccine drive that aims to cover close to 90 lakh children between August 17 and September 25 in the State. As part of the National Measles Elimination and Rubella Control Program of the Centre, the drive will cover children from 9 months to 15 years of age. The authorities are aiming to cover 60 lakh children in schools, 20 lakh children in Aanganwadi centres and 10 lakh children who are not in schools anymore. The first phase of the MR vaccine drive was launched earlier this year in which Tamil Nadu, Goa, Puducherry and Lakshwadeep had participated while Telangana, Andhra Pradesh and Kerala in South India are the States included in the second phase of the MR vaccine. To make the MR vaccination drive effective, authorities are collaborating with private practitioners, bodies representing doctors and educational institutions. Doctors said that parents can opt for administration of MR vaccine for their children, even if they have already been immunised. Health Minister, Dr. C Laxma Reddy also assured that the MR vaccine has proven its efficiency in the first phase of immunisation drive, which was taken up in Tamil Nadu. In private practice, MMR (Measles, Mumps and Rubella) vaccine is already prescribed by doctors in Hyderabad and elsewhere. This is for the first time that the State and Central governments are getting involved in administration of MR vaccine to children in the State. The first phase of the MR vaccine drive was launched earlier this year in which Tamil Nadu, Goa, Puducherry, and Lakshwadeep, had participated. Telangana, Andhra Pradesh, and Kerala, in South India are the States included in the second phase of the MR vaccine. This is a mega MR vaccination programme and for the last three months we have been preparing ground for the launch of the drive. Unlike polio vaccines that are administered in the oral form, MR vaccines come in the form of injections. A lot of care has been taken to maintain the cold-chain management. Already, close to one crore vaccines had arrived and 50 per cent of the stock had already been distributed to the districts. To make the MR vaccination drive effective, authorities have reached out to all private practitioners, bodies representing doctors, and educational institutions. Officials are estimating that 60 lakh children can be administered the MR vaccine in schools and colleges alone. In private practice, MMR (Measles, Mumps and Rubella) vaccine is already prescribed by doctors in Hyderabad and elsewhere. However, this is for the first time that the State and Union Governments are getting involved in administration of MR vaccine to children in the State. Once the month-long administration drive of MR vaccine concludes, it will become a part of the routine immunisation programme, which is administered in government hospitals. Once large numbers of children were administered the MR vaccine, over a period of time the entire population would develop immunity to measles. Keeping this in mind, authorities were aiming to administer the vaccine to a whopping 90 lakh children in a month.